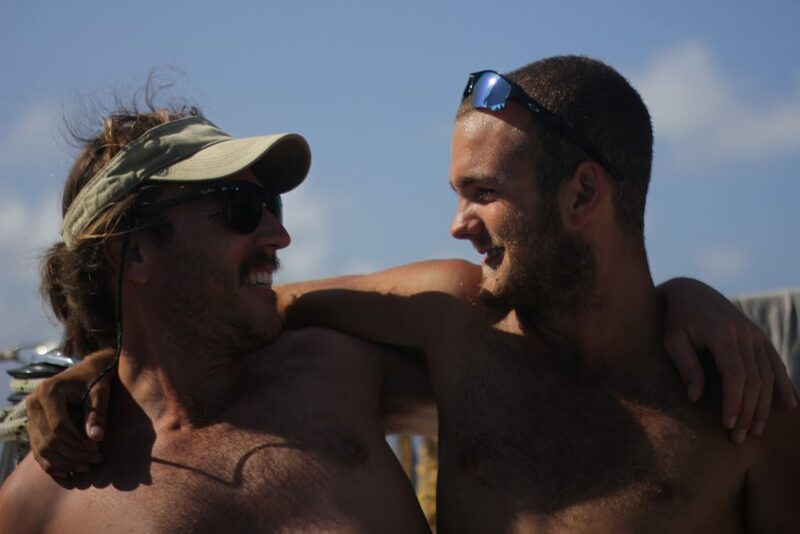 Ben Lecricket runs the boat while the team take a break. Until a few hours ago there wasn’t much to report. We’ve been pushing on through a slowly building sea-state for all of last night, which has been creating a really quite bumpy ride. 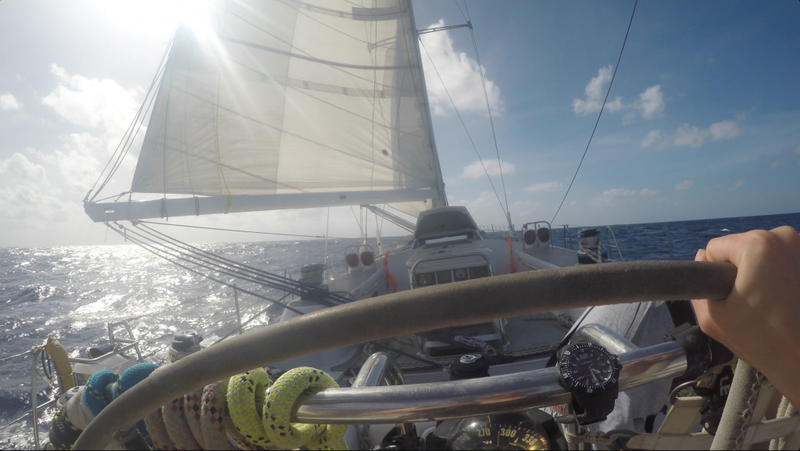 With the wind still on the nose, it was another big chunk of motor-sailing. We discovered for much of the late afternoon that Disco would in fact drive herself in a perfectly straight line, if the correct length of rope was used to tie the wheel. This enabled a very civilised team dinner and a much less civilised game of Uno. 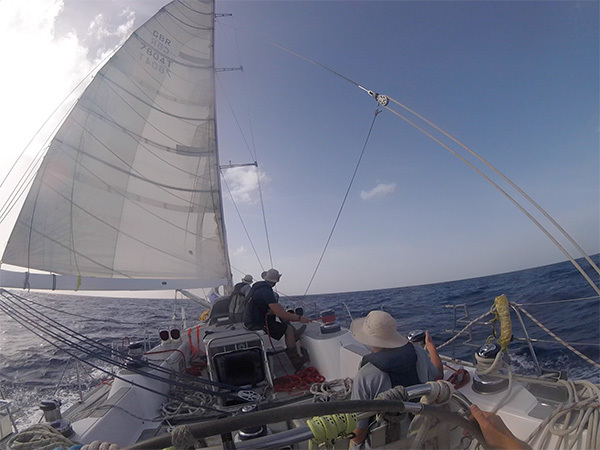 The occasional dash up to deck was required to put right an unexpected dive off course caused by a larger than usual wave or gust, but generally speaking we trucked along spot on course. I don’t know if that means Ben Lecricket was technically running the deck while we played Uno, but it seemed to work out ok, so I can only assume he knows what he’s doing now. Ty got up in the middle of the night when I was on my watch to find me sat at the nav station, doing some reading, a length of yellow line running across the ceiling and out onto deck. I had not fitted an auto-helm, but I had managed to create a remote-helm, which was almost as good. Having established which way the boat was naturally pulling with the sail plan, I set up a system of rope that could pull the wheel in the opposite direction from down below. With a bit of tinkering, there was a system whereby you could sit at the nav station, and if we started to wonder off course, just reach up and pull the a string, like you would on a bus when you want it to stop. A frequent pop up on deck to check the world around, and back to the warm. Coffee didn’t even get cold as you drank it. Perfect. This afternoon has seen the wind and sea state build dramatically. 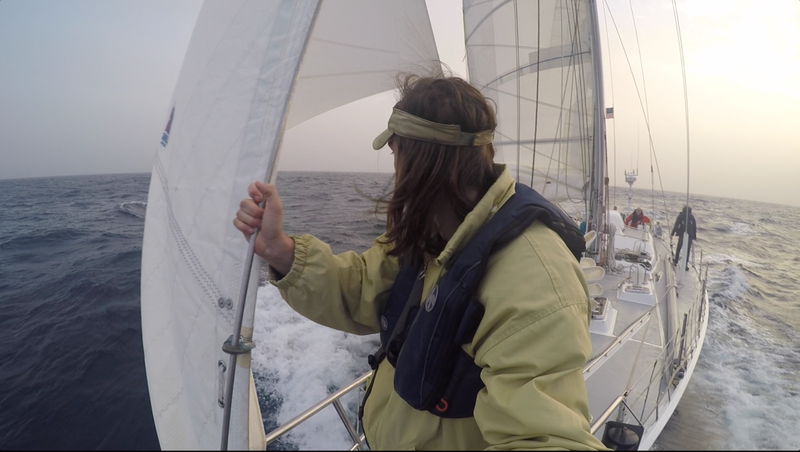 This has also precipitated some serious foredeck action for the first time in a while. The genoa has been unceremoniously stuffed down the fore-hatch, the Yankee one dragged back on the high side as far as possible and well trussed up with sail ties, and the Yankee 2 is now hanked on and ready to go, but with no immediate plan as for its use as we are more than powered up enough already, with more than enough un-contained sail lying around. 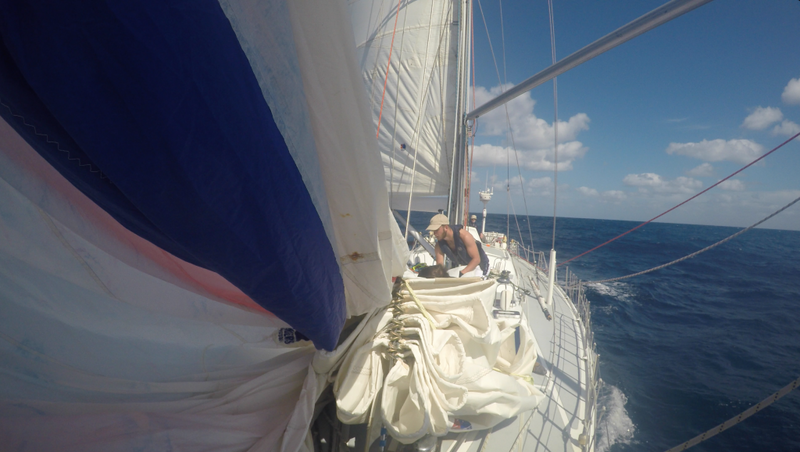 However, the conditions are not safe or sensible to try and flake our largest headsails across the deck with only 5 of us. 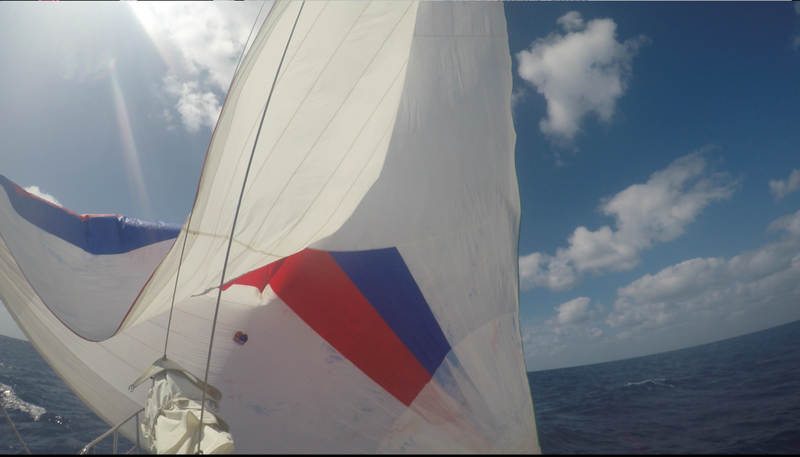 It was a real shock to the system to suddenly be dragging sails across a diving foredeck that was regularly going underwater, dealing with the sea trying to drag the sails away, while managing to move around constantly clipped on. At least the water was warm though. We are just on our approach to Cabo San Lucas to carry out a small refuel. Adverse wind and current have meant we’ve used more fuel than intended up to this point, so a top up here will enable us to confidently make San Diego without any further delay, regardless of the weather. We’ve got some people on the ground helping out this time, so hopefully it will go much smoother than the last one! From a bumpy, bucking, and boisterous Disco, good evening.